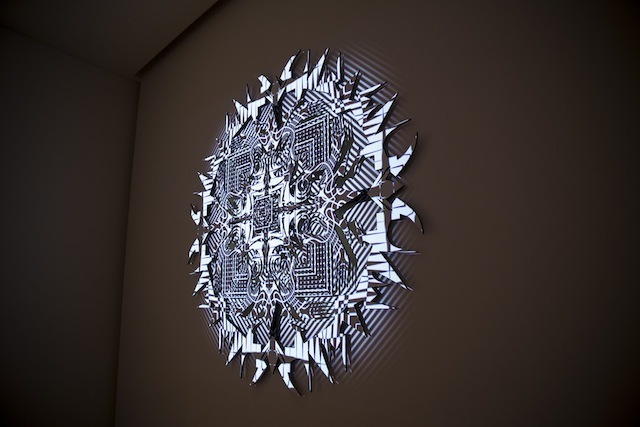 Check out Kit Webster’s hypnotic, projection-mapped kaleidoscopic wall sculptures. This article was originally published on December 9, 2014 but we think it still rocks! 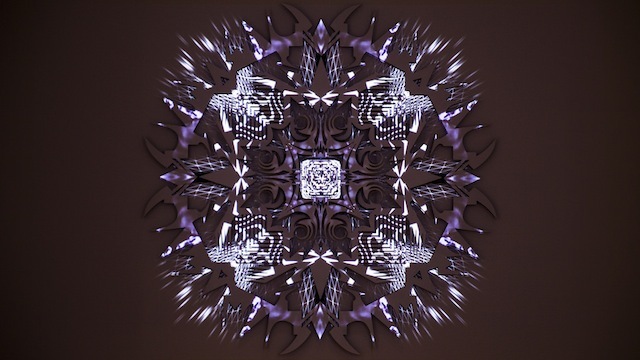 Kit Webster’s hypnotic, projection-mapped sculpture, Plateaux, is like a portal into an alien world. 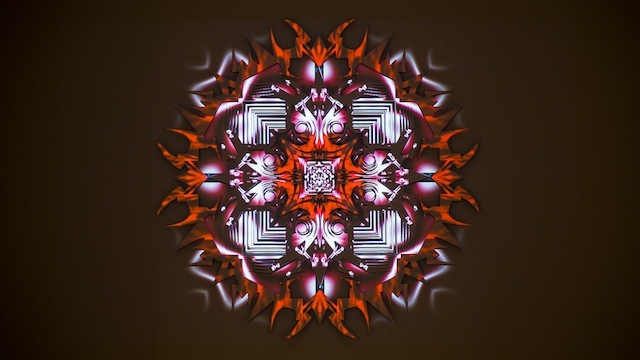 Webster—whose past works, Hypercube and Vertex, have featured previously on The Creators Project—has layered complex, laser-cut surfaces with projected animations to create a morphing, mind-bending kaleidoscope of light and sound wherein the boundaries between the real and the virtual, the 2D and the 3D, are constantly confused. 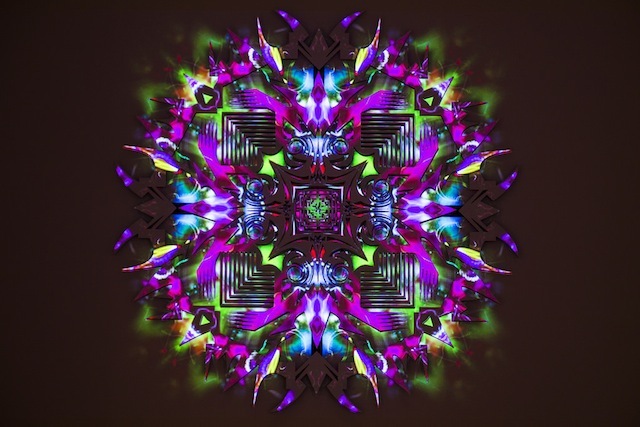 Incorporating enigmatic imagery that evokes the decorative reliefs of ancient cultures, this psychedelic, audiovisual installation continues Webster’s exploration into technology and the mental effects of meditative and abstract sensory experiences. 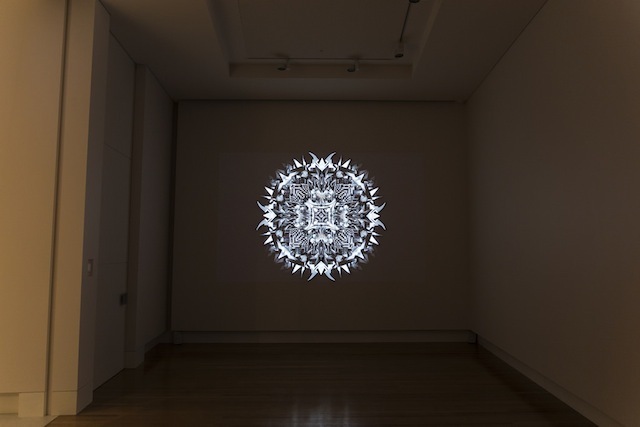 The Creators Project caught up with the artist to talk about art in the technological age, the galleries of the future, and how the perception of light and sound might work to expand the mind. The Creators Project: Your work plays with geometry and spatial dimensions, confusing the boundaries between 2D, 3D, and the physical and virtual worlds. How did this interest develop? 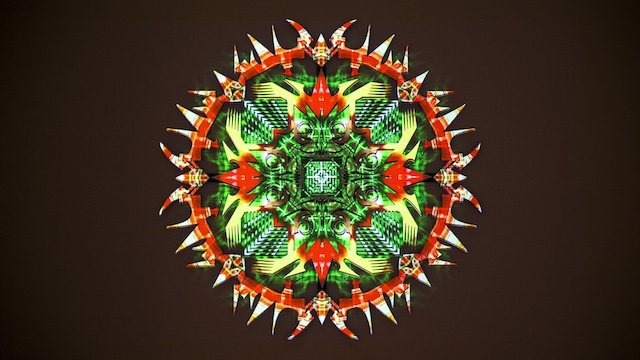 Kit Webster: I’m really interested in space and sensory perception and how you might develop something that works across the multiple dimensions of the virtual and physical. Also how that connects with consciousness including what effects these different dimensions might have on the mind. In the future there’s going to be a lot of shifting back in forth between the different dimensions of virtual, physical and mental. I’m still in the process of exploring—obviously there’s a lot of science behind it. Is exploring and harnessing new technology an important part of your practice? I’m really interested in the development of screen and LED technology, also flexible screens and their potentiality to allow sculptural works to be texturized by live video. I feel like there’s not enough interaction between the fine arts and cutting edge technology. These kinds of technologies could be used for aesthetic applications, but instead they’re developed as products. It would be great to be able to harness them for their aesthetic qualities. Also looking into VR a bit at the moment. I started working a lot in the commercial arts sector. I think there’s definitely going to be a lot more interactive VR experiences around where you put on a headset and walk around artworks, interact with them using your hands. Particularly in the gallery context. Imagine a gallery space but there’s nothing in the gallery because you’re wearing a headset. I think there’s a huge scope for work like this that hasn’t yet been explored. What’s the concept behind Plateaux? I’ve been developing a live visual set over the past few years which incorporates a range of different animations, geometries and color palettes—seeing how they might be mixed to create the best visual outcome. I’ve worked out a way to translate that into my sculptural work as a visual projection. The method I use combines a few different techniques such as masks and layers of animation. The idea, when it comes down to it though, was simply to try to create the most visually effective outcome. So they’re not conceptual—they’re purely about aesthetics? From the start, my work has really been about exploration, so there hasn’t been much thought into the conceptual basis of my projects. 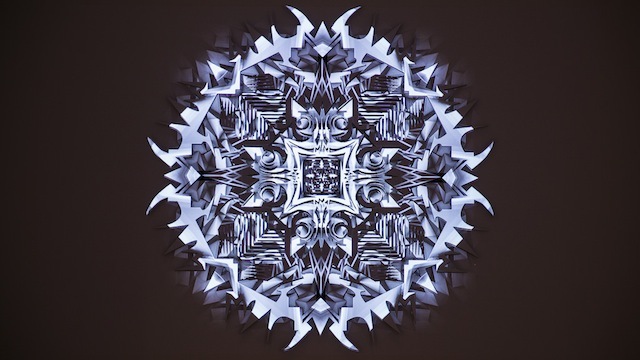 Even though I studied fine arts, I haven’t really gone down that path—I’m more interested in the sensory experience of the piece, although also in the ability of computers and the kinds of outcomes that can be created by a computer. But I’m starting to have a bit more respect for the conceptual reasoning behind some things. There are things I want to do that are probably not going to be possible in my lifetime. I’ve mentioned the science and technology side of my work, and I think that that is the conceptual reasoning behind a lot of what I do. What’s the significance of the historical motifs? Is it a reference to a particular culture? The first version of work was actually created for an Asian restaurant. But I’m also kind of interested in ancient artwork as well and the way that in these historical works there’s often a strong focus on geometry and patterning. What I like about my ‘new’ or ‘contemporary’ sculptures like Plateaux, though, is that these kinds of works were never possible in that age without [the dynamism] that digital technology such as projection-mapping now allows. In some sense the sculptures are then about a new form of cultural representation in this digital age—about a fusion of the old and the new. You’re interested in creating a sense of the ‘inexplicable.’ What do you hope that we, the audience, might gain from this? Just the abstractness of inexplicable experiences, really—it comes down to our understanding of the universe and the fact that we don’t really know what reality is and there are all these scientific theories coming out about black holes and string theory and whether the universe is a hologram. Just the perception that we grow up and that our mind is moulded in a particular way and that we’re living in this society which in many ways is quite monotonous. It’s about trying to expand or broaden our openness to different kinds of experiences that don’t have any connection to what has previously been accessible. I think its good for your mind to be able to do that. Powerful audiovisual experiences can be quite meditative. It’s like going to a concert with the music bringing on the lights and the video, but more abstract and pushing more boundaries in terms of what’s possible with sound and vision. 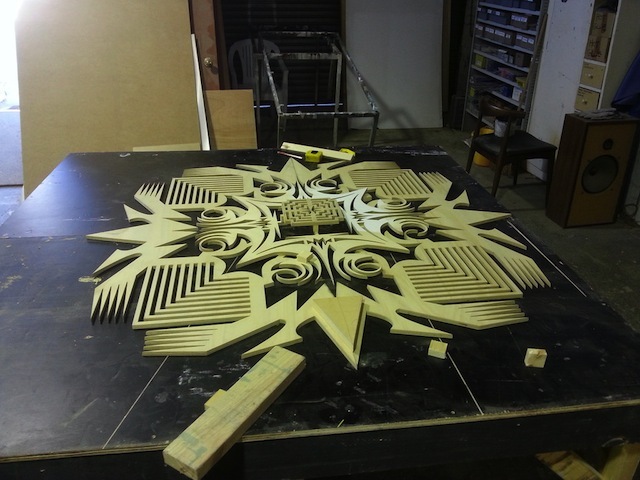 Visit Webster’s site here to peruse his other mind-boggling installations.